« *** WINNERS *** Cassie, Kat, Nancy and Rita are Living the Life of Riley! CONGRATULATIONS! One of the things I really enjoy about Riley, now that she is almost three years old, is her new capacity to play games. Before, she was just too small to understand games with real rules. Of course, we have always enjoyed a good round of peek-a-boo, building block towers or playing with stuffed animals, but I've longed for the day when we could play actual board games together. ThinkFun has a great selection of Junior Games, just perfect for toddlers and preschoolers. They allowed Riley and I to review the new Snack Attack game. Keep reading to learn more! I reviewed the Snack Attack Game from ThinkFun, which retails for $19.99, but is currently on sale for $16.32 with FREE SHIPPING. Craving a fun time? Bring Snack Attack to the table and serve up a fast-paced, picture-matching, token-stacking challenge that will have players of all ages coming back for seconds. The player that finds and stacks the most matching Snack Tokens on their Snack Plate wins! 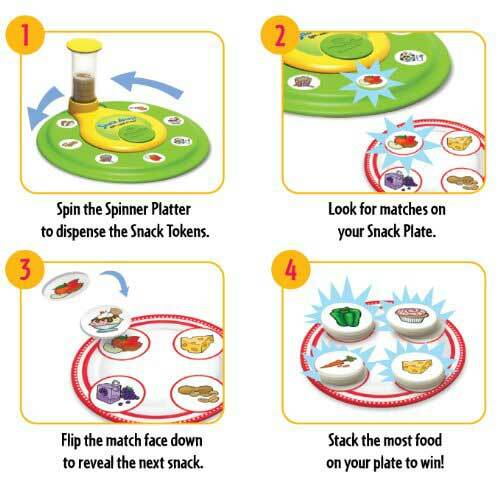 The Snack Attack game from ThinkFun is designed for children ages 4 years old and up. Personally, I believe that younger children can play too, as long as they are closely supervised by an adult. The small snack tokens could present a choking hazard for small children, but my two-year old daughter loved playing this game and quickly figured out how to play. Her favorite part of the Snack Attack game was without a doubt the Spinner Platter. Riley was in awe of how the snack tokens were loaded into the tube and then when the handle was spun around the platter, all of the tokens magically appeared in the right places! After we had played about five or six rounds of this game, she still kept wanting to fill the tube up with the snack tokens and spin the handle around the platter all by herself. This seemed to be a toy in itself! 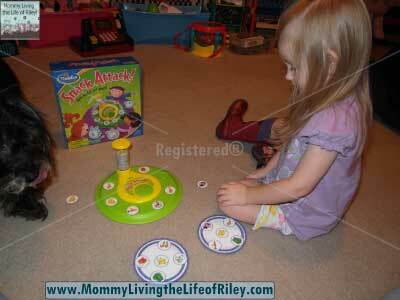 With the Snack Attack game by ThinkFun, we finally have a game the whole family can play together! If you have a young child who is eager to begin playing board games, then I highly recommend shopping the selection of well-designed Junior Games from ThinkFun! 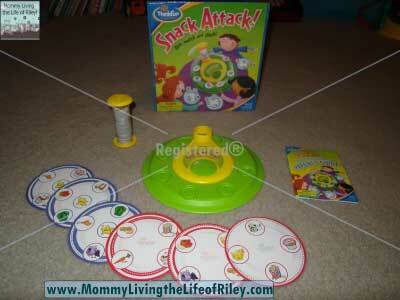 Disclosure: I received the Snack Attack Game from ThinkFun in order to facilitate my review. No other compensation was received. This product review is based on my own personal experiences with this item and is completely honest and objective.